Carlos Echevarria, Javier de Pietro, Antonella Costa. The title comes from roll-call, Present and Absent. The setting is a secondary school. The issue is sexual desire and attraction, seduction and boundaries and the consequences of crossing boundaries. The film is brief, small-budget, the work of writer director, Marco Berger who has also edited the film (which is generally darkly photographed and has a sometimes disconcerting score). Berger has said that he admires Hitchcock thrillers, especially Psycho, where a central character dies and is absent from the rest of the film. The theme is controversial. How calculating can a 16 year old boy be as he discovers his sexual orientation and connives and contrives to place a teacher in a situation that has a plausible prima facie innocence? And how does a teacher who knows the ethical boundaries deal with such a calculated situation? The treatment is frank but generally restrained which makes the film an interesting case study. 1. 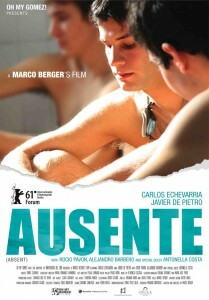 A small film, small budget, intense, Argentinian – but universal interest? 2. The director as writer, director, editor? His perspective on sexual desire, in the teacher, the student? The issue of abuse and seduction? Challenging the audience? 3. The dark photography, the atmosphere of a suspense thriller, the visual style, the atmospheric score? 4. The sense of realism – until the final fantasy? 5. The title, for roll call, present and absent? Martin absent from so many classes? Then absent from the film? 6. The setting, the introduction to Martin, sixteen, the physical examination for the swimming, the change rooms and his observations, the team, the coach, swimming? 7. Martin as a character, age sixteen, his home life, his parents, sister, his lies, Sebastian and contriving the eye difficulty, Sebastian and his concern, taking him to the hospital, the situation with his grandmother, with his friend, not knowing where the house was, the mobile phone calls, his decision to stay, calculating everything? 8. Sebastian as teacher, his girlfriend, their talk, the issue of boundaries? His driving Martin, to the hospital, home? Allowing Martin the shower, giving him the T-shirt? The pizza? Sleeping on the couch? Martin and his going into Sebastian’s room, the approach, withdrawing? The drink in the night? The next morning, breakfast? Sebastian arranging everything? The landlady and her visits? Seeing Martin from the shower? The man hosing the garden and his suspicions? The ethics for the teacher in having an under-age person in his home? 9. Martin and his friend Juan Pablo, their discussions, the girl coming to study? Martin and his lies, his parents upset, at the school? His presence in class, absence from the swimming coaching? Seeing him at home, with his sister, with his girlfriend? The ball, on the roof, his accidental fall? Absent from the film? 10. Sebastian and the aftermath, hearing the gossip? The landlady? With his girlfriend, her curiosity, his being upset? Teaching the classes? The change of arrangements, for the swimming, going into the classroom, the speeches, the last glimpse of Martin? His not reading out Martin’s name for the final class? 11. His leaving the girlfriend, returning to the club, remembering, Martin and his approach, the fantasy, the labyrinth, the searching, the kiss, the mystery? His self-awareness – and learning something about himself? 12. The director’s statement about desire, the calculation of an under-age young person, the lack of awareness in a heterosexual teacher? The difficulties of boundaries and ethics? The audience and their estimation of the behaviour of each of the central characters and its appropriateness?